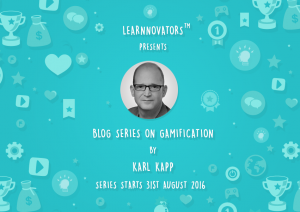 Learnnovators has Karl Kapp writing a series of blog posts for them on gamification. Karl Kapp is one of the foremost experts and prominent ‘gurus’ on gamification, which is the application of game design techniques to non-game situations. The leading e-learning company Learnnovators launches a series of blog posts on gamification written by Karl Kapp for them. Karl Kapp is one of the foremost experts and prominent ‘gurus’ on gamification, which is the application of game design techniques to non-game situations. Gamification seeks to engage and motivate people to achieve certain goals by tapping into the basic desires and needs of users, and is today being adopted across a wide variety of corporate and educational contexts. The goal of this series, comprising of five blog posts, is to establish a fundamental understanding about gamification, and to provide pointers on how it can be implemented within an organization. This first post starts off by defining gamification and its two types, followed by the second post, which covers the most common pitfalls of gamification, as well as advice for avoiding these pitfalls. Subsequent articles go on to discuss the engagement aspects of gamification, possibilities afforded by gamification, and mistakes often made by organizations attempting gamification for the first time. Discover the first post of the gamification series, Gamification for Corporate Learning, published on 31st August 2016. Karl Kapp, Ed.D., CFPIM, CIRM, is a scholar, writer and expert on the convergence of learning, technology and business operations. He is a full professor of instructional technology at Bloomsburg University in Bloomsburg, PA, and serves as the Assistant Director of Bloomsburg’s Institute for Interactive Technologies. He received his Doctorate of Education in Instructional Design at the University of Pittsburgh. Karl Kapp has written six books including the best-selling learning book The Gamification of Learning and Instruction and its accompanying how-to book The Gamification of Learning and Instruction Fieldbook: Theory into Practice. Learnnovators is a multiple-award winning organization that specializes in the design and development of innovative and effective e-learning solutions for the workplace. The company helps clients address skill and performance gaps in their workforce by creating customized learning solutions that are aligned with their business goals. Whether it is choosing the best mode of learning techniques tailored to organizational objectives, or creating customized content, or designing interactive modules with the help of games or simulations, Learnnovators has implemented innumerable learning programs to the satisfaction of a global clientele. These solutions have been deployed on a variety of contexts and devices, such as mobile phones, tablets, interactive white boards, interactive kiosks, etc. Learnnovators has also crafted several just-in-time, micro-learning modules and performance-support solutions for their clients. Ravi Pratap Singh (Co-Founder, Learnnovators), says "The goal of this series, comprising of five blog posts, is to establish a fundamental understanding about gamification, and to provide pointers on how it can be implemented within an organization."